I am huge fan of colors during Summer! Really, who does not wear more white or blue or green or any bright colors during Summer? And this is the style also for the jewels and the accessories. 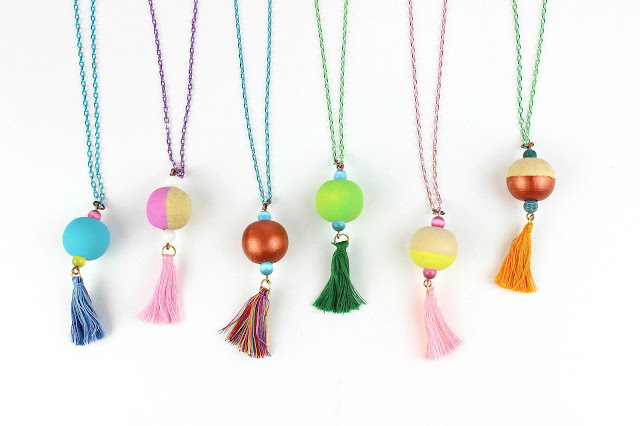 So, join me to create a cute long necklace with Summer and Beach Mood! And guess… your little helpers can help you with the painting part! For the first step of this craft we can always use the help of our little helpers! 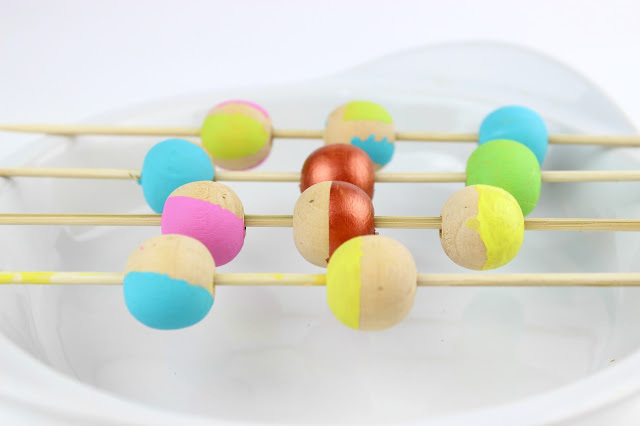 Just add the washi tape on the wooden beads in that way to create free spaces in a geometric style and start paint them! 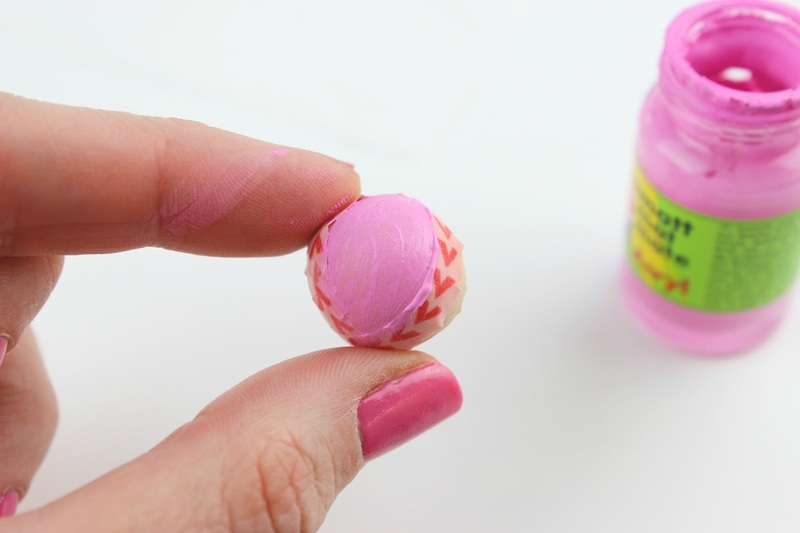 Of course it is up to us if we just paint the bead without creating any pattern. Remove the tape carefully, pass them from the wooden sticks, put them in a way that they will be on the air and let them dry. 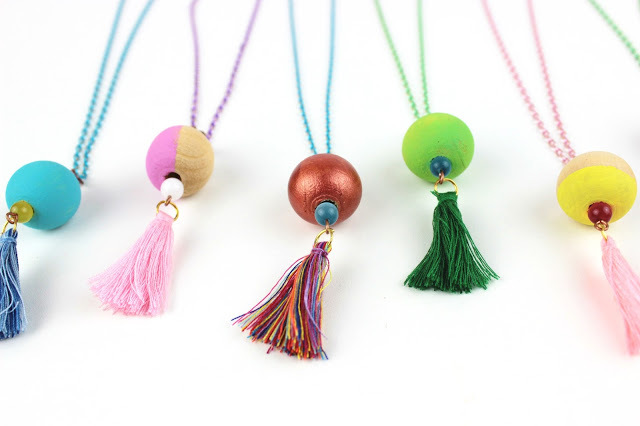 Our wooden beads are ready! Just use also a mat varnish without color in order to stabilize more the color! And now the jewelry making part! 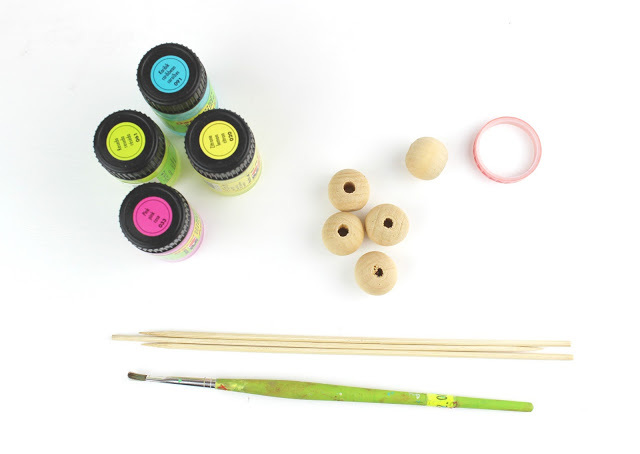 With the wooden beads it is really easy to create whatever we want. 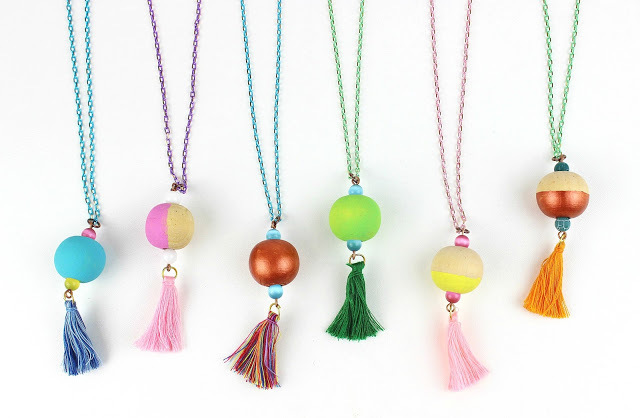 My proposal is for a hippie but minimal ling necklace with a tassel like the one I made last year, my beloved Long Boho Beaded necklace! 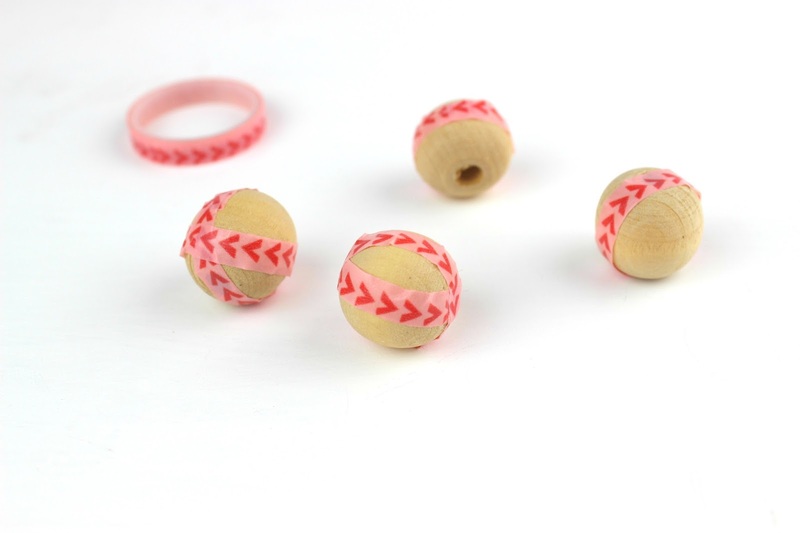 Just pass the beads on the headpin and with a plier tool make a ring on the free edge. With a jump ring we connect the bead charm with the tassel and on the other edge we just connect another jump ring. Our charm is ready! Just pass it on the chain and close the chain’s edges with jump ring and the lobster! Ready! They look great! How did you even come up with the idea? And, yeah I always feel like color can brighten almost any atmosphere. Τι τελεια που είναι. Υπέροχα Χρώματα που σε φτιάχνουν την διάθεση!!! Ευχαριστούμε πολύ για τις οδηγίες! 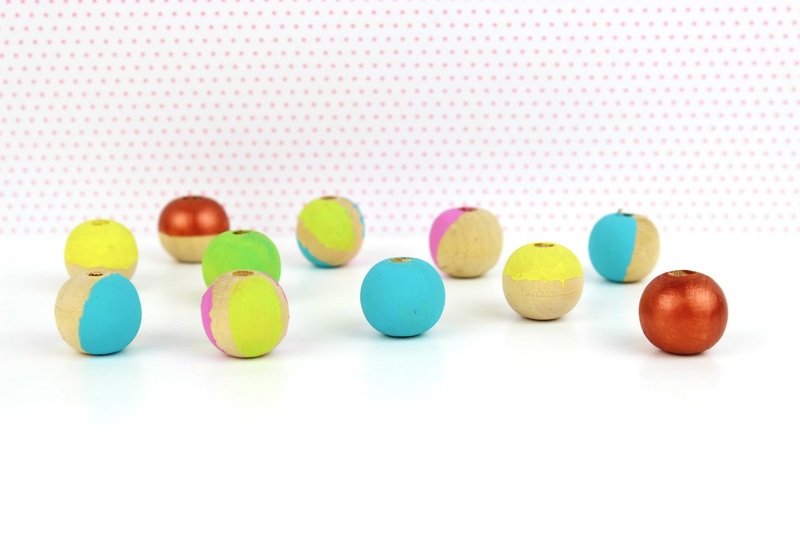 These are so awesome and such a fabulous idea. I really like them and the materials look easy to find. Thank you Angela. The materials actually can be found in any craft store. BRAVOOOOO!!!! Θα το κάνω με τα κορίτσια στη Θάσο!!! Φιλάκια φιλενάδα!!! χαχαχα ειδες; εσενα σκεφτόμουν λεμε! Καλες δημιουργίες! Τι όμορφα κοσμήματα, Ζίνα μου!!! Με τρελαίνουν! Φιλάκια!